Aurora Pens have been synonymous with high quality, good taste and fine Italian craftsmanship for almost one hundred years. 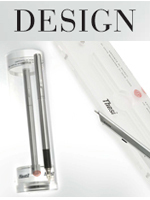 It takes two and a half years to create a new Aurora Pen fine writing instrument. In each Aurora pen model, the craftsman tradition and the most advanced working technologies combine with knowledge and creative research to make unique timeless fine writing instruments. 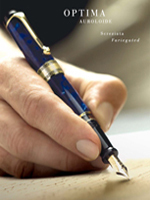 Because of this tradition of excellent pen craftsmanship, Aurora fountain pens are amongst the most renowned fine writing instruments available. 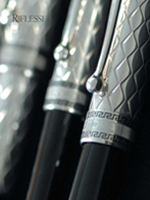 Luxury fountain pens and limited edition fine writing instruments for collectors. Aurora Optima Riflessi pens feature the classic geometric guilloche pattern. 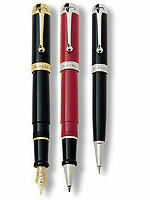 Optima Pens re-evokes the elegance and sobriety of a model which made history in the Thirties. 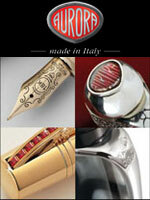 The Aurora 88 Ottantotto Collection returns the great luxury writing pen classic from the 50's. 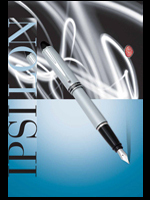 The Aurora Ipsilon Pen collection are the Italian fine writing instruments for everyday use. Aurora Talentum Pens reflected a spirit of innovation, freshness and modernity of the new millenium. Fruit of the collaboration between the Aurora Style Department and the architect, Marco Zanusso. 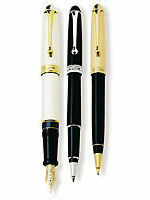 Luxury writing pens for daily use crafted in marbled resins with chrome trim. 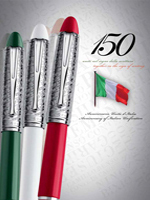 Special and limited edition pens honor the 150th anniversary of the unification of Italy. The first fountain-pen produced in 1919, today considered a cult object, was also the first in a long series of successes linked not only to its classic design but also to values which Aurora communicates, such as knowing how to dedicate time to the things that truly count, to thoughts, feelings, beauty and culture. Values which have no fear of time, just like the lines and precious materials that characterize the production of the historic Torino company. 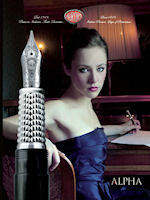 An Aurora pen is much more than simply an instrument to write with, it is a way of life. The constant tension between modernity and tradition infuses, within the forms of an Aurora pen, all the philosophy of a company that is awash with history but which has at the same time always demonstrated that it knows how to look to the future. The Aurora Pens pen "Museum of Signs and Pens" is a very ambitious project which arose within the Aurora company to satisfy the need to recover the company's historic memory and its desire to diffuse the culture of writing and the world which revolves around it. To realise this project it is necessary to gather the fragments of history dispersed round the world, many of them probably lost during the second world war bombardments. It is essential that they be brought together and made them available to everyone as part of the reconstruction of a journey involving more than 85 years of Aurora activity. Whoever owns pens, old catalogues, historic prints, or any other material, belonging to the Aurora Pen collections, and wants to make it the common heritage of everyone, is requested to communicate with Aurora Pens. The old Benedictine Abbey of San Giacomo Buazano is the chosen seat for this historic museum, which will bring together 4.000 pieces, within an ideal space and atmosphere, to conserve what Aurora Pens has represented and continues to represent in the history of writing. In its museum, Aurora Pens seeks to relate the story of its evolution through those elements that have most distinguished it: pens, old machinery and equipment used in the manufacture of pens, old prints and publicity concerning the world of writing. A story told through images and objects so that an ancient art, so richly permeated by the present, can also diffuse its charm and allure in the future.